Walking into this house purchase, I knew that I loved the ever growing trend of using Grey as a neutral in your house. 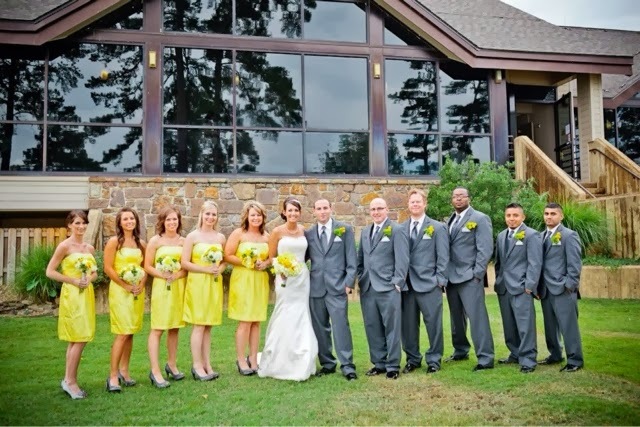 I’ve loved mixing grey’s with various colors as you can see here from our Grey and Yellow wedding. I wanted this trend to carry over into our home as I am so past the color beige! So far you have seen our idea boards and our furniture all of which contain my new favorite color…grey. But our next adventure in the department of Grey is a big one. Choosing the right Grey for our walls. Who knew walking in to this, that I would soon face 50 different shades of Grey! Literally! I walked into our local Sherwin Williams for a few paint chips to hang on the wall and had to pick between the blue-grey’s, the purple-grey’s, the green-grey’s, I mean the list could go on. 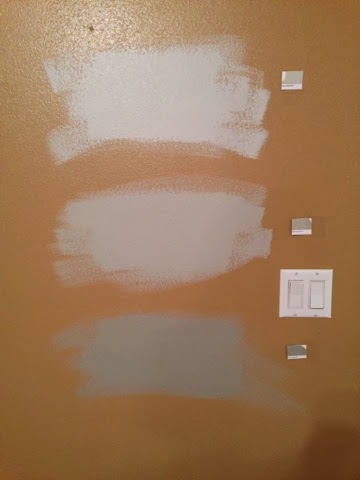 I wanted a true grey (handy little trick, pick the paint chip that has a true black on the bottom, so that your not having to guess if the grey has a different hue to it.) Narrowing it down to about 20 different shades of Grey, home I went to cut and tape up my paint chips along the wall. This process narrowed it down to 5 shades of Grey. Sorry for the lack of picture with this process. Finally, after living with paper taped to the wall for a week, I had dwindled down to 3 shades of Grey. Back I went to SW (who the heck knew that this would be such a difficult process.) I still had not made a final decision, so paint samples were a must. I loaded up with my 3 Shades of Mindful Grey, Repose Grey, and Dorian Grey samples, and home I went to splash it up on the wall. Repose is the top color, Mindful is the middle color, and Dorian is the bottom color. I stopped by this wall every chance I got, morning, noon, and night, to see how it looked in the various shades of lighting. After a couple of days, we finally agreed that Mindful Grey was my main squeeze. Repose Grey will accompany us down the hall. You always want a lighter color down the halls. So here I am this weekend getting ready to start the very large project of painting the living, dining, and kitchen area. See you on the flip side for the master reveal.